It’s all about overflowing beer, authentic German delicacies, rollicking fun with friends, and rock bands during the third annual October Beer Festival at the Grand Ballroom of luxury integrated resort City of Dreams Manila on October 12 and 13, 7pm to 11pm. 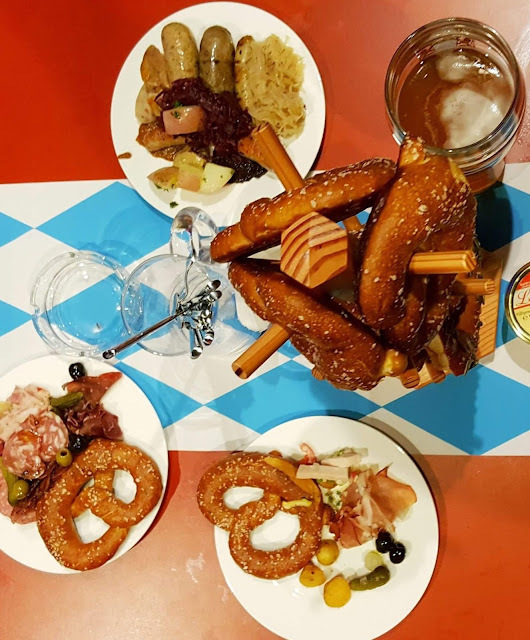 Originally, the Oktoberfest is a celebration in honor of the wedding between Crown Prince Ludwig of Bavaria and Princess Therese of Saxony-Hildburghausen in October 1810, which became an annual German festivity. Nowadays, it has evolved to a global event with some countries adopting the merriment with a flair for local entertainment and culture. In Manila’s various establishments including City of Dreams, it is customary for modern revelers to raise their beer glasses and partake of hearty fare while they enjoy live entertainment. For this year’s October Beer Festival, OPM pop band True Faith is set to perform their classic 90’s hits with Part 3 Band and Eye Candies on October 12. Popular rock band Parokya ni Edgar brings the house down with their crowd-pleasing rock ballads on October 13. Gloc 9 and Eye Candies will also perform on the second night. Exciting raffle prizes and beer games complete the Oktoberfest. Guests can immerse in the annual German Oktoberfest in the festive ambiance of City of Dreams Manila’s grand ballroom complete with colorful buntings, long wooden tables and benches; and indulge in a variety of beers such as Weihenstephaner from the oldest brewery in Germany and the world, Sapporo from Japan, Heineken from Netherlands and local beers San Miguel Pale Pilsen, San Miguel Light, and craft beer Pedro. Sodas and iced tea are also available. This assortment of beers and beverages complements the German gastronomic fare. 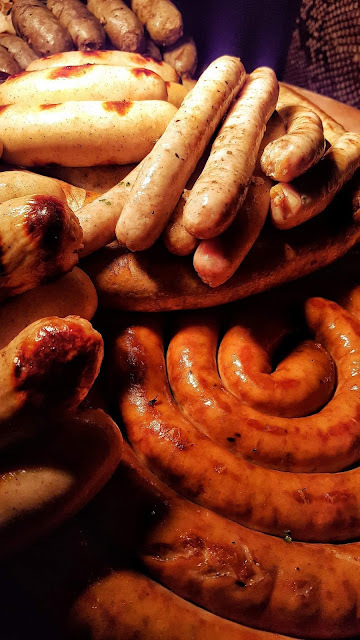 The Bavarian-style buffet indulges meat lovers with a live carving station of Spanferkel (roasted suckling pig), Schweinerollbraten in Biersoße mit gefülltem Wirsing (pork roll in beer sauce with stuffed savoy cabbage), Brathendl (German-style roast chicken), Grillhaxe (roast pork knuckle), Fleischkase (German meatloaf), and Bagger mit Apfelmus (potato pancakes with apple puree) with accompaniments of Bratkartoffein (sautéed potatoes with bacon and onions), Sauerkraut (braised white Cabbage), Rotkohl (braised red cabbage) and Kase Spatzle (handmade noodle drops with caramelized onions and cheese). German food aficionados can also look forward to the scrumptious array of sausages and Bavarian specialties: Weisswurst (traditional Bavarian white sausage made of minced veal and pork back bacon; and flavored with parsley, lemon, mace, onions, ginger, and cardamom), Bratwurst (grilled German sausage of finely minced veal, beef, or pork), Nürnberger (pinkie-finger-sized bratwurst sausages), Knacker (short and stubby smoked sausage made of beef and flavored with garlic), Bockwurst (boiled Frankfurt sausage made from veal with some pork or other meats and flavored with salt, pepper, and paprika), Thuringer (famous and traditional German sausage with a recipe dating back to 1404, made of finely chopped lean pork from the shoulder or belly with some beef or veal, combined with garlic, cumin/caraway, marjoram, sometimes even coriander and nutmeg, and packed into hog or sheep casings) and Wiener Würstchen (Vienna sausage); Sauerbraten (vinegar marinated braised beef); and Wienerschnitzel mit Preiselbeeren (breaded veal escalope with lingonberry); paired with Zwiebelkuchen (german onion tarts) or a variety of breads and pretzels with butter. 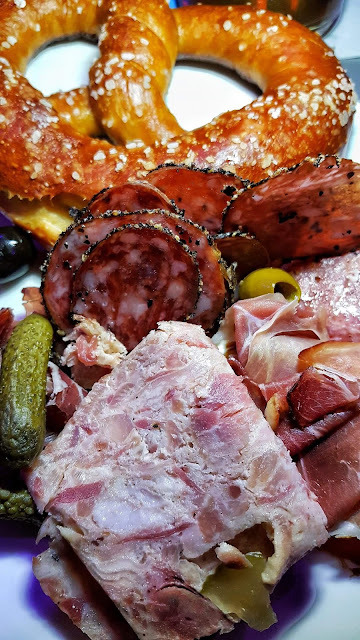 Appetizers include Schinken (Black Forest Ham), Bierwurst (yellow sausage), Landjager (smoked sausages), Schinken (smoked ham speck), Stadwurst mit Musick (vinegar and onion marinated sausage), Obatzter (Bavarian marinated cheese with laugensticks), and Apfel-Grieben-schmalz (marinated onion lard spread with caramelized onions). A variety of salads and soups likewise add to the hefty selection of meats and savory items, composed of potato, cucumber, and red beetroot salad as well as Gaisburger Marsch (beef stew with vegetables and potatoes), Fleischbruhe mit Wurzelgemuse (beef broth with root vegetables) and Fladlesuppe (consommé with herb crepe). As a sweet treat, the Bavarian buffet features Bavarian crème; Milchreis (German rice pudding with fruit compotes, sugar and cinnamon); Black Forrest Gateau; Bienenstich (Bee Sting cake); Lebkuchen Herzen (ginger bread hearts); Sacher cake (Austrian chocolate cake); Schnecken (German cinnamon rolls); Linzer Cake (Austrian torte with lattice design on top of the pastry); and fresh Apfelstrudel (traditional Viennese apple strudel), fresh from the oven topped with vanilla, German berry compote, and Chantilly crème. City of Dreams Manila’s October Beer Festival at the Grand Ballroom is at PHP 2,700 net per person. Guests can also have a rocking good time if they avail of the October Beer Fest staycation package at P12,800 net. This staycation package includes an overnight stay in Nobu Deluxe room with breakfast for two and two October Beer Fest tickets to the Grand Ballroom on October 12 or 13. 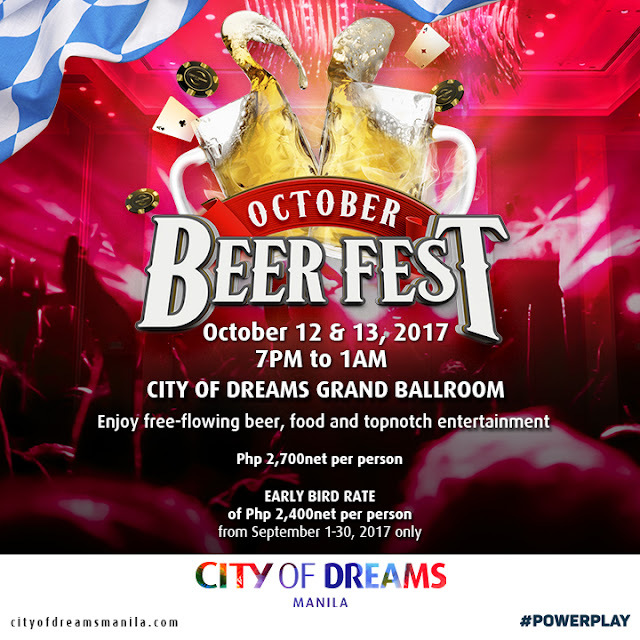 City of Dreams Manila Rewards Club members may approach the Dream Rewards or Signature Club counter to avail of the October Beer Festival passes in exchange of required Dream Rewards points. For inquiries and reservations, please call + 63 2 800 8080, e-mail guestservices@cod-manila.com or visit www.cityofdreamsmanila.com. Event tickets can also be purchased via SM ticket outlets and smtickets.com. Terms and conditions apply. The dynamic and innovative resort complex, located on an approximately 6.2-hectare site at the gateway to Entertainment City, includes the ultimate in entertainment, hotel, retail and dining and lifestyle experiences with aggregated gaming space, including VIP and mass-market gaming facilities with 286 gaming tables, 1,605 slot machines and 176 electronic table games.